BentoLunch.net - What's for lunch at our house: Bento & News! We have news! We're moving next week! Not far, thankfully, we're still staying here in Colorado Springs, but we found a great house right near the post, with a big yard for Dante-dog and a big kitchen for me. And larger bedrooms for the kids, and a fireplace, and all the things we've missed over the last two years. I'm trying to pull all my favorite Halloween bento items aside since this is kind of my favorite bento making season. But last week? No Halloween yet (I save Halloween till after my birthday, which is Monday). 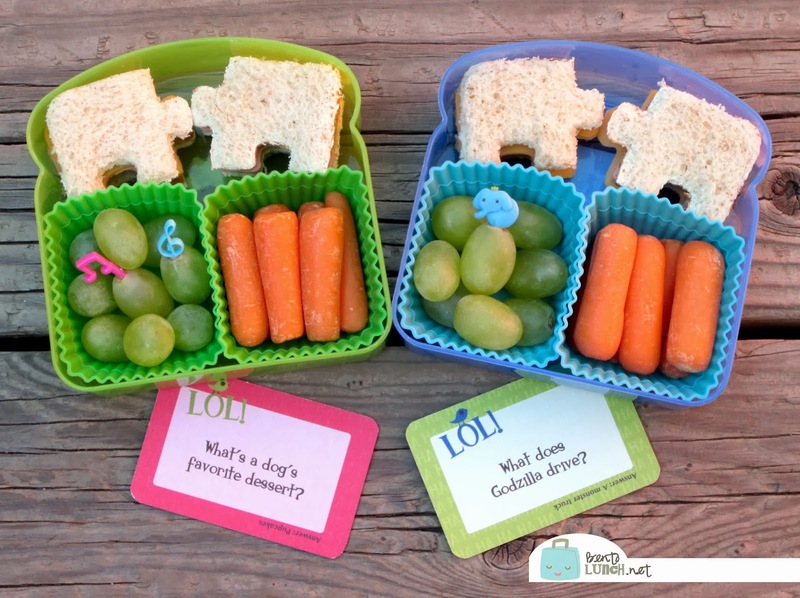 The kiddos needed a quick mini-lunch, so they took puzzle piece sandwiches (ham and cheese on honey wheat), cut with our Lunch Punch puzzle cutter. The boxes are old sandwich containers that work well for mini punches, if you cut up the sandwiches. They also had grapes and carrots, along with (not pictured) applesauce in our Squeez'ems containers and yogurt in a reusable cup. And this week, we're using our new Lunchbox Love notes--these ones have jokes! Great lunches, and Happy Birthday!! Congrats on the house & Happy Belated Birthday!